Louie and his 2 sons Steve and Phil spent 2 amazing days with Okeechobee Fishing Guides/Shellen Guide Service. These guys came from Ohio to enjoy some time with there dad in the great outdoors. There was some rivalry going on by the 3 of them the whole trip so it made for a lot of laughs on my part. We had a great day and looking forward to tomorrow. 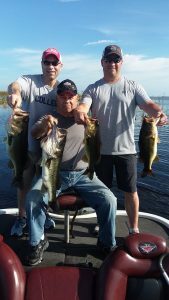 These fish were caught on a live wild shiner along with 25- 30 other quality Lake Okeechobee bass.